Prof. Hyunhyub Ko (School of Energy and Chemical Engineering) and his team have created a skin-like material that can detect pressure, temperature, texture, and sound. From left are Youngoh Lee, Jonghwa Park, and Prof. Ko. New materials, designed to mimic the sensing capabilities of human fingertips. Taking a big step towards adding a sense of touch to prosthetic limbs and other medical devices. Researchers have long been interested in the technology of artificial skins. Although previous studies have introduced an assortment of electronic skin (e-skin) elements, none of them were able to detect both pressure and heat with a high degree of sensitivity, untill now. A Korean research team, affiliated with UNIST has developed a new form of e-skin that may share the capabilities that human skin has. Through this study, the team introduced human skin-inspired multimodal e-skins based on flexible and microstructured ferroelectric films, which enhance the detection and discrimination of multiple spatiotemporal tactile stimuli, such as static and dynamic pressure, temperature, and vibration. This study was jointly conducted by Prof. Hyunhyub Ko (School of Energy and Chemical Engineering) of UNIST and Prof. Heon Sang Lee (Department of Chemical Engineering) at Dong-A University. 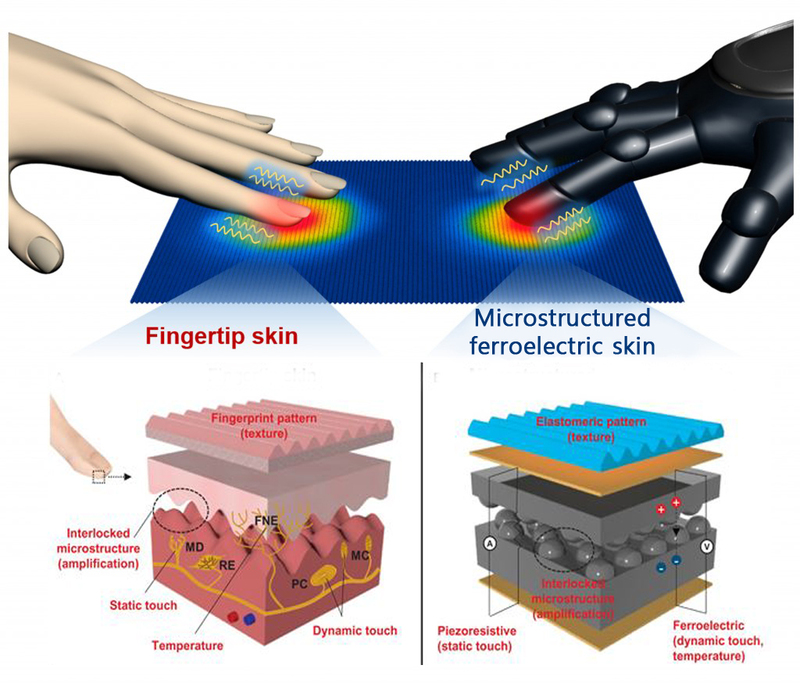 The figure above demonstrates a comparison between the human fingertips and the human-skin-inspired multifunctional e-skin. 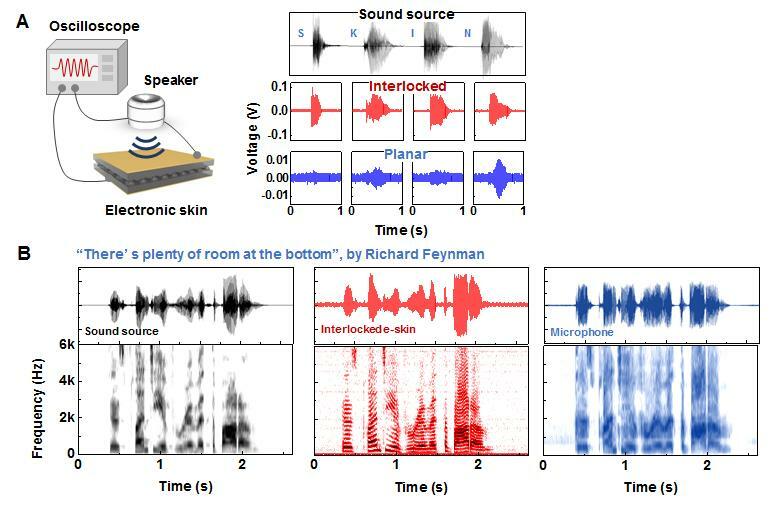 Indeed, as shown in the picture above, the functionalities of human skin are mimicked by elastomeric patterns (texture), piezoresistive (static pressure), ferroelectric (dynamic pressure and temperature), and interlocked microdome arrays (tactile signal amplification). In this study, Prof. Ko and his team placed a soft ridged film over bumpy plastic-and-graphene sheets about the thickness of a few layers of Saran Wrap. Touching the e-skin pressed electrodes on the bumpy sheets together, causing current to flow through the device, which was hooked up to a machine that meaures electrical signals. 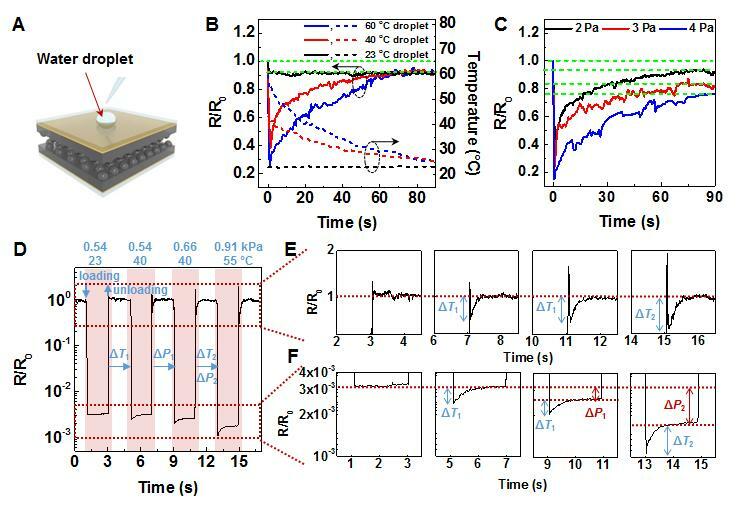 Electric current was also observed when heating the e-skin, showing that it could also sense temperature. 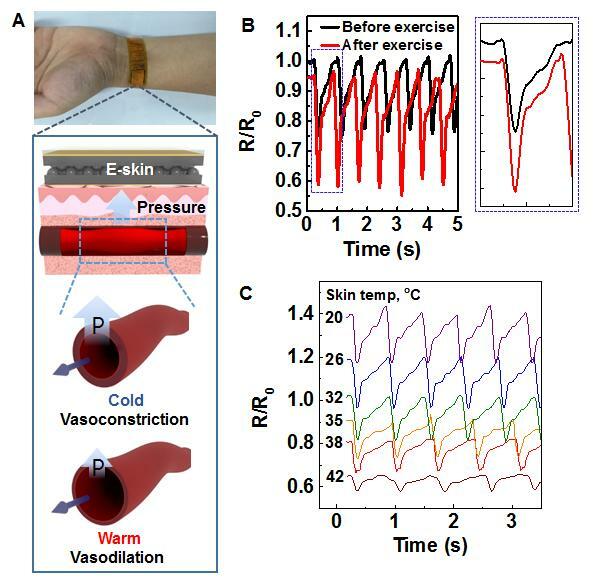 A strip of the e-skin placed on a person’s wrist, letting the researchers simultaneously measure skin temperature and blood pressure. Prof. Ko states, “Though the technology has yet to be tested outside the lab, the work takes a big step toward adding a sense of touch to prosthetic limbs and other wearable medical devices. This work has been supported by the National Research Foundation (NRF) of Korea, the Center for Advanced Soft Electronics funded by the Ministry of Science, ICT, and Future Planning as Global Frontier Project, and the Graphene Materials/Components Development Project funded by the Ministry of Trade, Industry & Energy of Korea. Jonghwa Park, Marie Kim, Youngoh Lee, Heon Sang Lee, and Hyunhyub Ko. “Fingertip skin-inspired microstructured ferroelectric skins discriminate static/dynamic pressure and temperature stimuli.” Sci. Adv., 2015, 1, e1500661.